As you know, there are plenty of situations when you mix your own concrete rather than having it delivered from the ready-mix plant. For example, customers often expect to see small sample pours when they are considering decorative work. 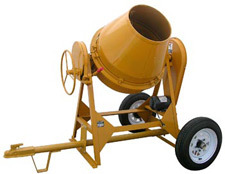 Whether you are proposing stain, exposed aggregate or stamped concrete, a mixer is a great option for creating samples. What's more, in this struggling economy, contractors who used to concentrate on larger jobs are finding that repair and maintenance work can keep a crew busy between big projects - patchwork and resurfacing jobs are perfect situations in which to mix your own concrete. And the concrete countertop industry is full of artisans who mix their own batches. In fact, mixing your own concrete simply makes sense on many smaller jobs. Most ready-mix companies have a three-yard or more minimum. And what about pours in tight spots (a backyard patio for instance) that require laborers to wheelbarrow the concrete to the site? Because they are easy to move around, mixers are ideal for those situations. 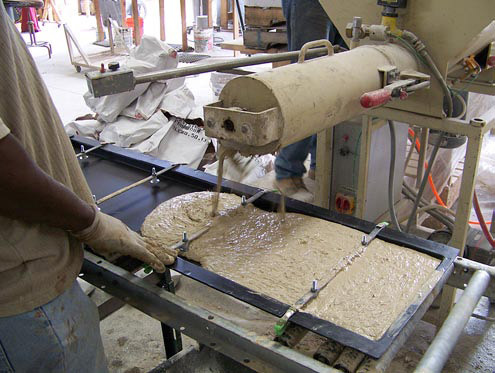 Some choose to mix-on-site for the control it gives them over batch consistency and quality - an increasingly important consideration for decorative concrete contractors. When mixing their own concrete, contractors can control slump, workability, color, and the time of day they pour the concrete. 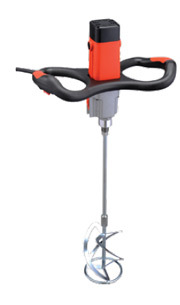 There are a number of mixers available, both hand-held and machine-type, to do the job. Countertop contractors and companies that specialize in patchwork and resurfacing may find that a hand-operated mixer is best, while contractors that specialize in flatwork may prefer a mixing machine. 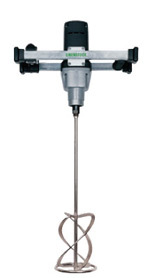 Hand-Held Mixers generally consist of a metal shaft with paddles on one end that attaches to a heavy-duty drill. Some manufacturers make shafts specifically for their driver, while others offer shafts that can be attached to a drill of the operator's choosing. Shafts are usually made of high-strength steel and paddles are available in a plethora of shapes and sizes. There are also "high-shear" mixers designed for GFRC (glass-fiber reinforced concrete). Mixing Machines are available in a number of sizes (with capacities from about 3 cubic feet to 12 cubic feet) and a couple of basic design shapes (drum or mortar/horizontal shaft). Smaller units are ideal for small jobs and creating sample pours. 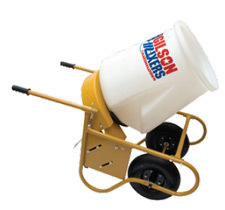 They are often available with wheels and handles, allowing the operator to wheel the mixer to the job site. Some larger machines include a tow bar. Ergonomically designed handle with a soft grip. Two-speed power with a soft-start feature and constant speed control. Safety on/off switch with lock-on button for continuous operation. Heavy-duty gearbox with a powerful high-torque motor. Can be used hand-held or mounted in a mixing stand. Two-speed power. High-performance paddles work clockwise and counterclockwise respectively. A robust gearbox with a powerful high-torque motor. Ergonomically designed with soft-grip handles. Soft-start function and constant speed control. Soft start and variable speed for less splashing and better control. High-torque motor with specially designed gears provides maximum power and can mix quantities from 1 gallon to 35 gallons. Special paddles mix from the bottom up, eliminating the inclusion of air. Can be used hand-held or with CS Unitec portable mixing stands. Ergonomically designed metal frame and handles ensure comfortable handling. Unique handle design protects motor against damage when the mixer is laid down. 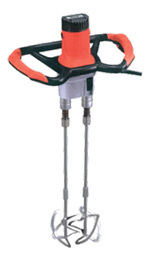 A universal agitator/mixer for use with an electric drill. Eliminates waste and aeration of materials in addition to cutting mixing time up to 90 percent. Patented construction and design is for mixing, not just stirring. Various sizes fit standard 1/4-inch, 3/8-inch, 1/2-inch and 3/4-inch chucked power tools. Has two sets of specially welded blades. The vertical blades keep the mixing action between them, while the horizontal blades employ a hydraulic-flow principle that prevents air sucking and pulls high-density material up from the bottom while forcing low-viscosity elements down. The Deluxe Mud Mixer from Kraft Tool Co. mixes all kinds of texture materials fast and thoroughly. Works in 5 - to 55-gallon drums. Can attach to 1/2-inch chuck (minimum) or larger drill. Paddle head is 9 5/8 inches wide and 6 1/4 inches deep. 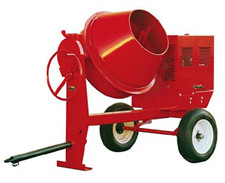 Kraft Tool's 26-inch Oval Mixer is a popular mixer for mixing self-leveling products used in concrete restoration and decorative concrete. Oval shape effectively removes air from material while mixing. FRP Equipment Inc. - The RimCaster Continuous Mixer, marketed by Ball Consulting Ltd. The RimCaster is used in situations where good mixes are required. It is especially useful in circumstances that require the use of fast-setting cements because the mixing/handling time is virtually zero. A ground hopper can be integrated with a RimCaster to reduce the labor associated with filling the metering hopper. Chassis mounted with rear hinge for hopper cleanout. Three-phase electric power with a 20-foot power cord. Solid-state overload and variable speed controls. DC-motor-controlled triple-diaphragm pump for water, polymer and plasticizer injection in the mix chamber with a clean water purge. Air-operated: capable of 20 cubic feet per minute (cfm) at 90 pounds per square inch (psi). Can be attached to a standard garden hose. Battery-operated digital flow meter with liquid flow control mounted on swing arm, including switch for powder only or powder and liquid together. Pneumatic toggle switch controls mixer motor and liquid injector. Material hopper with removable metering screw for easy cleanout. 55-gallon drum for liquids with air operated agitator. 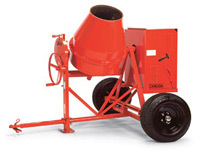 The 400 CM Series mixers are suitable for concrete, seed, feed and a variety of other materials. Convenient drum lock allows operator to secure the drum in any of five positions. Welded steel frame and heavy bushings for long life. Precision cast, one-piece ring gear. Quad-Mixing System utilizes a four-piece, replaceable paddle and blade combination that creates four different mixing patterns for a more consistent mix. Available with electric motor or gas engine. 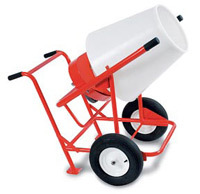 Mixes up to 3 1/2 cubic feet of cement or mortar mix or two bags of pre-mix concrete. High-torque, 1/2-horsepower, single-phase, 115-volt electric motor. Strong polyurethane drums won't crack or rust. Ring gear enclosed for safe operation. Handles adjust for easy storage. Clears a 30-inch door opening. Fast mixing and easy cleanup. 5 cubic feet of batch capacity. Towable with a welded steel frame, torsion bar suspension, spring steel axle, and a 2-inch ball hitch. Cast-steel pinion gear for superior wear and durability. Dump gear to provide better control when discharging material. 10-gauge steel drum is fabricated with 1/4-inch steel bottom and 3/8-inch thick reinforcing ring. Powered by either a gas or electric motor. 2 cubic feet of of batch capacity. Suitable for mixing grout and polymer-based materials in smaller quantities. Can mix all materials from sand and cement to self-leveling epoxies. Designed for easy transport by one person. Quiet enough to operate anywhere. Powered by a Baldor 1/3-horsepower electric gear motor. Available with steel or polyethylene drums. One-piece cast iron ring gear for longer life. Oversized dump wheel, which makes it easier to discharge material. Heavy-duty retractable tow tongue made of tough steel. Rugged 14-gauge steel engine covers with punched ventilation openings for increased cooling. Axle springs and large tires. 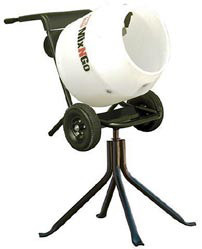 Multiquip's Mix-N-Go mixer can mix up to 3 cubic feet of material at once. A choice of steel or polyethylene drums. Gasoline or electric motor options - the electric engine can use standard household power. Mixer stand allows the drum to rotate 360 degrees. Can be used as a wheelbarrow. On/off switch protection - water-resistant and dustproof.